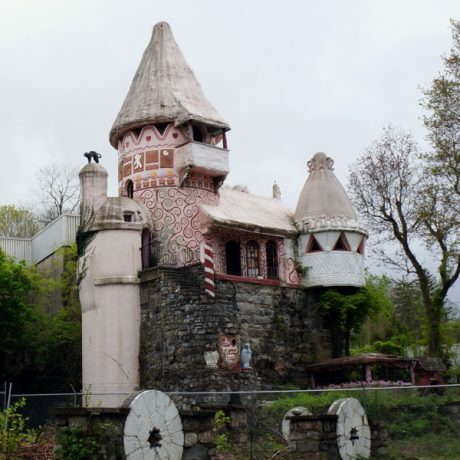 Once upon a time in the village of Hamburg, New Jersey, there were two unique historic resources on one property– an early 19th-century mill and an amusement park featuring a whimsical Gingerbread Castle. It used to be that both sites had value in the community, but alas, they are now obsolete. Without a vision for a new use, and quick investment in stabilization and restoration, the buildings will be lost, and the fairy tale will end. The Wheatsworth Mill was constructed in 1808 as a grain mill and operated continuously from construction through 1943. The oldest part of the existing mill is its center stone portion, constructed in 1808 and partially rebuilt with some Classically-inspired detailing after a 1834 fire. This mill was purchased by F.H.Bennett in 1921 and renamed Wheatsworth Mills in 1927, around the time that the extant five- and six-story concrete additions that now dwarf the original mill were constructed. The business was sold to National Biscuit Company (Nabisco) in 1931, again in 1937 to Canterbury Mills, and then again to the Plastoid Company in 1943. In the 1960s, Plastoid constructed a new factory in on an adjacent site but continued to use the historic 19th-century mill building as offices through the 1980s. The Gingerbread Castle was originally the centerpiece of an amusement park built adjacent to Wheatsworth Mill by then-owner F.H. Bennett between 1928-1930. The castle was designed by master Viennese architect and theatre set designer Joseph Urban, whose architectural credits include the now-demolished Zeigfield Theatre in New York City; National Historic Landmark Mar-A-Lago in Palm Beach, Florida; and the New School for Social Research in New York City, one of the earliest Modern buildings in America. Bennett commissioned Urban to design the Gingerbread Castle after attending a Metropolitan Open production of Hansel and Gretel, for which Urban had designed the sets. The castle is a three story concrete structure with circular towers decorated in stucco that is finished to appear smooth or textured, like cake icing. Decorative ornaments, brackets, windows, terraces, and finials add to the whimsical quality of the structure, which is raised on a rubble-stone base (and constructed on the foundation of a 19th-century kiln). Interior finishes are equally decorative. The site originally contained a number of independent sculptures representing popular fairy tale characters, as well as a train that chugged scores of visitors around the park. The popular attraction remained in continuous operation for 50 years, closing initially in 1978. In 1989 the castle re-opened but lasted only a few years before once again closing down. Both resources are key contributing elements of the locally designated Wheatsworth Mill/Gingerbread Castle Historic District, which was designated in 2009. The district also includes an installation of Arts and Crafts ceramic tiles at the mill and castle sites that were designed by the celebrated Flint Faience & Tile Company of Michigan. The tiles depict the original mill, food products made from wheat, and landscapes with a farming theme. Other resources in the district include two residences, a restaurant, greenhouse, dam and two bridges. Of the multiple historic resources in this district, the mill, castle, and tiles are most threatened. 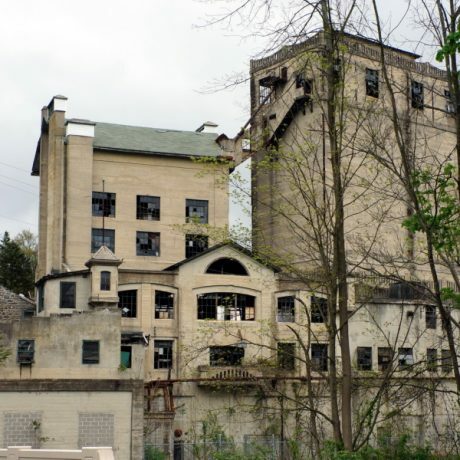 The mill, after close to five decades of vacancy, is in dire condition, with a partially collapsed roof and interior deterioration. The castle is secured and in fair but abandoned condition; some of its ornament, as well that of the related sculptures, has been lost to deterioration and vandalism. Several of the tiles, which are located on the pillars at the mill entrance, and along the stone walls near the mill and castle, have been removed and not yet returned. The entire site lacks a purpose; the milling industry no longer viable, and the small amusement park no longer self-sustaining. The current owner, a successful regional developer, purchased the property at foreclosure in 2007 with visions of a mixed use development of the mill for housing and retail. Some money for remediation of hazardous materials has been invested at the mill, but the complex continues to deteriorate. The future of the site depends on a cooperative relationship between the Borough of Hamburg and the current owner/developer (or a future developer), and mutual dedication and willingness to envision and effect a new use and activity for the property. Compromises and incentives will need to be mutually beneficial to entice financial investment while allowing accommodations for modern use. These separate but interconnected resources are a unique remnant of both Sussex County industry and leisure, and the Gingerbread Castle is further significant as one of a limited number of surviving works designed by Joseph Urban. These landmarks are intricately related to the area’s history and current growth and possess remarkable potential, but their survival depends on prioritizing their rehabilitation, and quickly.